Caritas Pakistan started the Volunteers Training Program (TP) On December, Caritas Pakistan commenced its Silver Jubilee Celebration. Frontier Province (now known as Khyber Pakhtunkhwa) was hit by an Earthquake February 1stCaritas along with Pakistan Red Crescent Society took part in relief and rehabilitation program. Second Animation Training Program was conducted. A seminar was organized “Caritas and Development” for the clarity of the concepts of development. This seminar was conducted in 1991 as an extension of the 1974 seminar Liberation through Development. The attendants of Caritas and Development seminar discussed more aspects of development within Caritas network and its target outreach unities. The focus was on traditional and cultural resource available for field workers to enhance the effectiveness of their work within target communities. The participants’ discussion was based on how political awareness changed Pakistan’s stagnant flow of development and how Caritas workers could use the trends at that time to create vital awareness. They agreed on the necessity to animate people so that they themselves should demand their rights from the government. First National Health workshop was conducted, as a follow up it was decided to hold such workshop in each diocese. Under the Chairmanship of Bishop Patras Yousuf the National Health Commissioner was created at Lahore. Ten steps of Animation were developed and adopted at grass root level for social mobilization. The ingredients for the “ten Steps of Animation” formula has been a direct result of Animators experiences in communities and professional training. 1st Strategic Planning process was initiated involving grass root people. 2nd Strategic Planning of Caritas Pakistan was conducted and Caritas Pakistan provided relief and Rehabilitation to Afghan Refugees. 3rd Strategic Planning of Caritas Pakistan was held and Caritas Pakistan facilitated in repatriation of 3154 Afghan Refugee families. 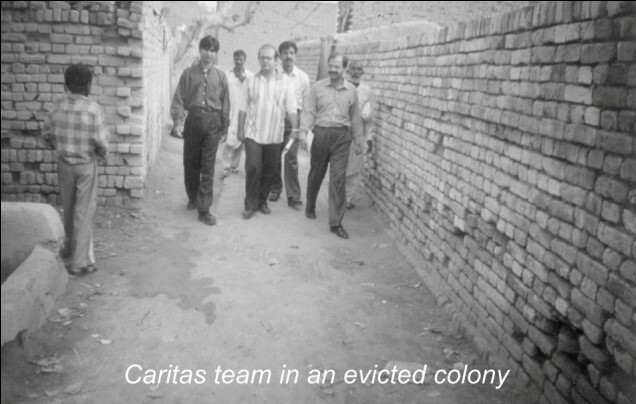 The revised constitution of Caritas Pakistan was approved by the General Body.Caritas Pakistan responded to the massive 8thOctober earthquake. Caritas Pakistan responded the cyclone affected people in Cyclone Yemyin which was a deadly tropical cyclone that made landfalls on India and Pakistan in June 2007. 4th Strategic Planning of Caritas Pakistan was held. Caritas Pakistan responded to Earthquake in Ziarat Baluchistan. Caritas Pakistan responded to the massive Floods in 2010 considered as worst floods in the history of Pakistan which inundated almost one third of the Pakistan. Mr. Amjad Gulzar joined as Executive Director of Caritas Pakistan National Secretariat. Caritas Internationalis Secretary General Mr. Michel Roy visited Caritas Pakistan and inaugurated a book “Restoring Dignity” of Caritas Flood Response. Caritas Pakistan was awarded with appreciation shield from National Disaster Management Authority (NDMA) for humanitarian work. Archbishop Joseph Coutts Chairman Caritas Pakistanhanded over a cheque of one million PKR to NDMA for relief work in Pakistan. 5th Strategic Planning of Caritas Pakistan was held. Disaster Risk Reduction integrated with Community Based Disaster Risk Management. Caritas Pakistan collaborated with UNESCO to implement school safety interventions. 25 staff members of diocesan units were provided with opportunity for international training on “Community Based Disaster Preparedness” in Bangkok by Caritas Asia. Caritas Pakistan responded to earthquakes in Mashkel and Awaran in Baluchistan. Convention of Caritas Pakistan Staff was organized with theme “Together We Proceed”. Caritas Pakistan responded to country wide floods in Pakistan. Following the request of Caritas Cambodia, Caritas Pakistan provided training on Search & Rescue and First Aid to Caritas Cambodia staff and National Committee on Disaster Management (NCDM) in August 2015. Caritas Pakistan reviewed the drought situation in Tharparkar and Cholistan. Caritas Pakistan responded to Floods of Pakistan in four Dioceses of Pakistan. Caritas Pakistan organized International Training on Community Based Disaster Risk Reduction with participants from other Asian countries as well. Caritas received ISO 9002-2008 certification on Quality Management Standards. Caritas Pakistan responded to IDPs crisis of North Waziristan. The First Women Farmer Conference was held from October 22 to 24 at Sargodha Institute of Technology. Mr. Amjad Gulzar Caritas Pakistan elected as member of Caritas Asia Regional Commission. Caritas Pakistan elected as member of Caritas Internationalis Representative Council (RepCo). 6th Caritas Pakistan Strategic Planning was held. Operational guidelines of Caritas Pakistan were reviewed and revised in line with national and International Standards. Caritas Pakistan celebrated Golden Jubilee year and the main event was held on September 14-18, 2015 at Renewal Centre Lahore.